↑ See Arnold, John P. (2005) . 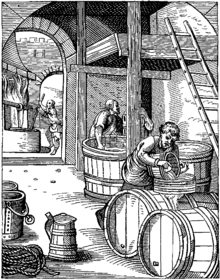 Origin and History of Beer and Brewing: From Prehistoric Times to the Beginning of Brewing Science and Technology. Cleveland, Ohio: BeerBooks. p. 34. আইএসবিএন ৯৭৮-০-৯৬৬২০৮৪-১-২. OCLC 71834130.